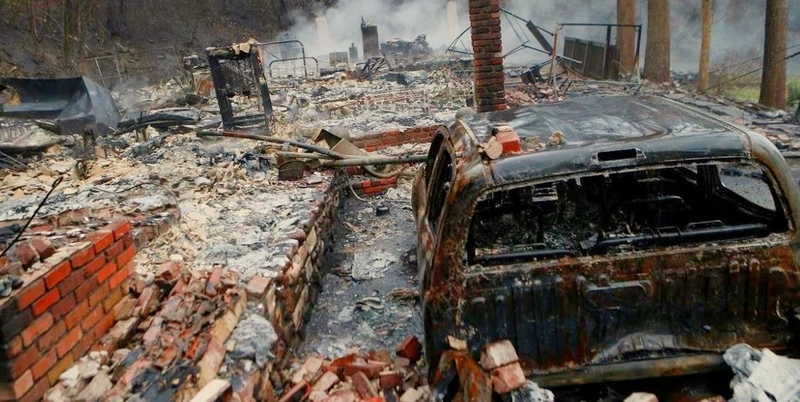 Home /failed_federal_policy, latest_news/Federal forest policies one big reason for worsening wildfires across U.S.
Over 60 years of total fire suppression policy led to more intense fires that are more dangerous and difficult to extinguish. The cost of fire suppression, unsurprisingly, has increased from 16 to over 50 percent of the U.S. Forest Service’s annual budget. That’s right: There are bigger, hotter and more frequent wildfires because of policies that focused on quickly and efficiently suppressing them in the past. After several large fires in 1905 and 1910, conservationists called for total fire suppression in order to protect timber, a valuable resource for a growing economy, and the United States Forest Service became the primary federal agency tasked with firefighting efforts. The U.S. Forest Service is still the main agency that works with the Department of Interior and state and local agencies to craft policy, provide resources, and fight wildfires. In 1935, a series of more fires led to the “10 a.m.” policy, with an aim to suppress all fires by 10 a.m. the day after they started. Scientific research, however, began highlighting the positive effects of fire on the landscape. Regular fires clear out overgrowth and dead foliage and, in some cases, are the catalyst for new growth (such as for Sequoia treegermination). This new research confirmed the actions of farmers, ranchers, and lumbermen – who had been working with fire for hundreds of years – changed the views of conservationists, and resulted in the abandonment of the 10 a.m. policy in 1978. Over 60 years of total fire suppression policy led to more intense fires that are more dangerous and difficult to extinguish. For instance, devastating fires hit Yellowstone National Park in 1988, destroying swaths of trees that are still charred to this day. Coupled with more people living near forests and wildlands, these fires now threaten more people and resources than ever before. The cost of fire suppression, unsurprisingly, has increased from 16 to over 50 percent of the U.S. Forest Service’s annual budget. Tasked with fixing their past mistakes, the U.S. Forest Service and other agencies are trying to practice more prescribed burning and manual clearing of overgrowth. Yet, controlled burns can quickly get out control if weather conditions change, such as when a fire that began as a prescribed burn turned deadly in Colorado in 2012. The alternative, manual clearing, is a slow, labor-intensive and costly process. This challenge seems daunting to overcome, since as we’ve seen, well-intentioned one-size-fits-all federal policies can lead to devastatingly unintended consequences. However, private forests, residential communities and non-profits are also responding to the challenge. While the U.S. Forest Service and other agencies often supports these decentralized efforts, wildfire policy still assumes that the response is inherently governmental. In order to limit the unintended consequences of bad national policies, conservationists should move more responsibility to the local level. More solutions and approaches by various conservationists, scientists, and residents will likely have a better chance of protecting forests and harnessing the role of wildfire in thriving environments. I’ve often wondered why the Forest Service doesn’t invite adjacent communities to participate in a 1 or 2 week clean up the forests event, where people could come haul away dead wood for home heating, or to take to Navajo elders who rely on it. I can see that as something that would work in San Juan County, but I’ve never seen it happen. I think it could do wonders for relationships between community and US Forest service. I think that would have helped in the Yellowstone area as well. People still use wood to burn in Idaho and Wyo. Try cooperation and conservation of that resource, in stead of burning it up for no purpose.